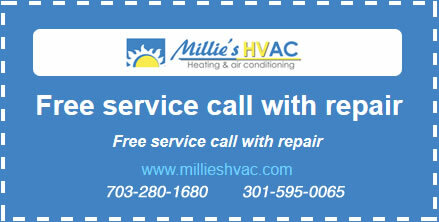 If the time has come to replace your existing water heater, Millie’s Heating & Air Conditioning is the company to call. Whether you just want to get the newer version of your existing water heater, or you think it is time to try out a new tankless model, we have the skills and expertise you are looking for. When you call us for a water heater installation in Great Falls, VA, or the surrounding areas, we will have a new one in place before you know it. We can also help maintain your water heater or make any necessary repairs quickly so that you don’t have to worry about interruption in your hot water access. Call today to learn more about our water heater installation services. If you are looking for a new water heater, we have a wide selection of both tank and tankless water heaters for you to choose from. Our technicians are familiar with all types and styles of these products, and we can install the model you choose that same day so that you aren’t left without hot water for very long. Improper water heater installation can lead to problems later on, and because our plumbers are certified professionals, you can be sure that they will get the job done right. At Millie’s Heating & Air Conditioning, we want to help ensure that your hot water supply is as efficient as possible, which is why we do all we can to promote conservation and green plumbing practices. Fortunately, you can lower your impact on the environment without having to sacrifice your comfort. Whether it is installing a tankless water heater to heat your water more efficiently, or installing a low–flow plumbing fixtures, we can help you make greener choices for your plumbing system. What’s good for your budget can also be what’s best for the environment. And while most homeowners are aware of the many water–saving and high–efficiency products on the market, choosing the right one can be overwhelming. That’s why we are committed to helping you find an environmentally–friendly solution to all your hot water and plumbing needs. Call Millie’s HVAC if you are interested in saving money with green plumbing equipment. The Great Falls, VA water heater experts at Millie’s Heating & Air Conditioning offer quality installation services to customers throughout the service area. We will help you select the water heater that is the best solution for your hot water needs, as well as your budget. We’ll also work with you to figure out your energy–saving goals and help you choose a cost–effective water heater that will help save fuel and lower your utility bills. Be sure to call the water heater specialists at Millie’s HVAC the next time you need a water heater installation or replacement service.